Max Sali, CEO of Defense Metals, speaks with Peter Epstein of Epstein Research about the latest developments at his company’s REE project in British Columbia. Defense Metals Corp. (DEFN:TSX.V; DFMTF:OTCQB) is a great name. The company is defending against Chinese dominance of Rare Earth Elements (REEs), and Defense Departments require select REEs to defend their countries! Several REEs are very difficult or impossible to replace in critical applications, yet enable products essential to modern civilization. Any company outside of China that can reliably produce a few key REEs will have a license to print money. This week, SGS Canada provided select head assay results from a 30-tonne bulk sample. Four REE assays were reported in this press release. (See chart below.) Using the price/kg of each metal, the in-situ value is ~US$ 535/t. That’s equivalent to ~ 0.41 troy ounces gold or ~12.8 g/t gold. The Wicheeda deposit (6 claims, 1,780 hectares) is 80 km northeast of Prince George, in British Columbia, (BC) Canada, and contains potentially exploitable concentrations of Rare Earth Elements (Pell, 1994; Lane, 2009, 2010). The deposit was explored in the 1970s and 1980s, but received little further attention until 2008 when it was drilled by Spectrum Mining Corp. That company reported an Inferred resource of 11.3 million tonnes. More recently, SGS Canada provided us with an important update on the deposit. Four REE assays from a 30-tonne bulk sample we sent them earlier this year showed significant concentrations of both neodymium and praseodymium. The Wicheeda deposit is a very exciting project because we can potentially get it into production fairly quickly, especially given nearby infrastructure (roads, rail, water, power, labor, mining equipment and services). 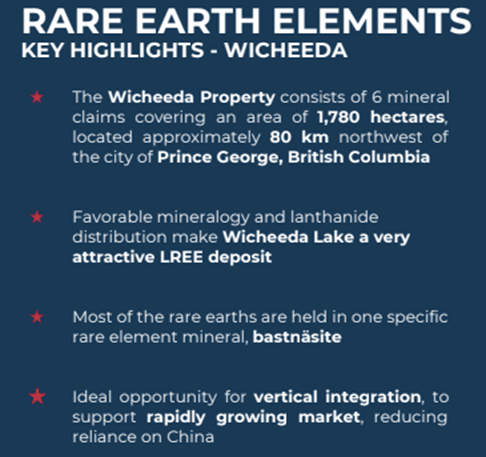 A favorable mineralogy and Light Rare Earth Element (LREE) distribution make the Wicheeda deposit highly attractive. Some impurities can be removed through electromagnetic separation done on site. The press release we put out this week was important because it gave us a new understanding of the deposit (see graph below). Total Rare Earth Oxide (TREO) was 4.81%, which we feel is attractive. Wicheeda is ideally suited for open-pit mining and conventional flotation to produce a REE-enriched oxide concentrate. In addition to lanthanum, cerium and neodymium, we also have praseodymium. Importantly, the deposit is open in most directions and outcrops at surface, meaning a low strip ratio and the potential for expansion. Encouraging bench-scale tests have been done, giving our team the goal of a 60%+ concentrate. 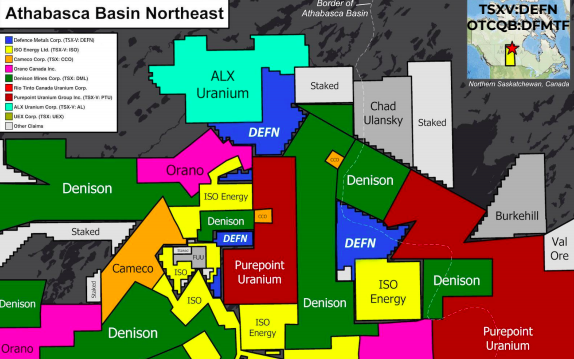 Although the main focus is our rare earth deposit, we also have two prospective uranium properties (five claims blocks), in the heart of the eastern Athabasca basin near Denison Mines and IsoEnergy. Both of those companies are spending millions on drilling this year. IsoEnergy has made a new high-grade discovery 5-10 km from one of our properties. The following REEs can be found: lanthanum, cerium, praseodymium, neodymium, samarium, europium, gadolinium, yttrium and dysprosium. There are also trace amounts of a few others. Neodymium and praseodymium are the most valuable in the suite. 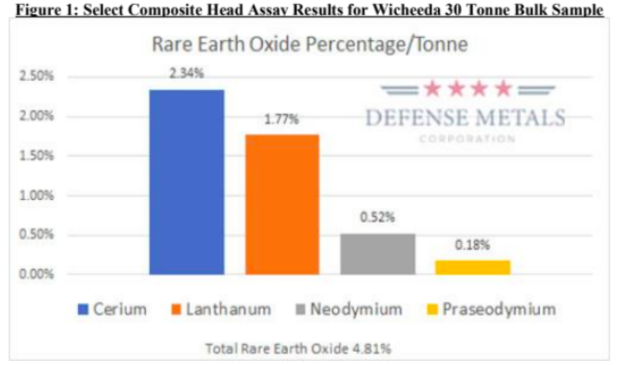 Neodymium and praseodymium are the most important rare earth metals we have identified at the Wicheeda deposit. Neodymium (Nd) and praseodymium (Pr) are the two rare earth elements that form the majority of rare earth permanent magnets. Below are five-year price charts from Kitco. The most recent prices of US$62.0 per kg for neodymium oxide and US$78.4 per kg for praseodymium oxide are down from recent highs, but up 35%40% from mid-2016 lows. Bench-scale flotation and hydrometallurgical testwork was done on Wicheeda deposit drill cores at a SGS Lakefield lab during 2010/2011. SGS successfully developed a flotation flow sheet that recovered 83% of the rare earth oxide (REO) and produced a concentrate grading 42% REO. Subsequent hydrometallurgical testing in 2012 on a 2-kg sample of the concentrate grading 39.7% TREO (total REO) produced an upgraded and purified precipitate containing 71% TREO through a process of pre-leaching and roasting. SGS Canada is well into the planned work program which includes chemical and mineralogical characterization, grindability and laboratory flotation testing on a 200-kg subsample (of the 30-tonne surface bulk sample). The objectives are to validate the process and confirm that conditions of the previously established 2010/2011 bench-scale drill core flotation testwork can be upscaled to the current bulk sample, in addition to further optimization of the process flowsheet. As mentioned, Defense Metals delivered a 30-tonne surface bulk sample from the Wicheeda deposit to SGS Canada. SGS is conducting a multi-phase program of bench-scale metallurgical test work preparatory to commissioning larger scale flotation pilot plant testing. Larger scale pilot plant production is expected to validate bench-scale metallurgy and produce LREE product samples for potential off-take partners. The ultimate goal of the test work is to finalize the process flowsheet prior to the commissioning of larger-scale pilot plant testing. SGS has agreed to give us regular updates on its progress. In addition, Defense Metals plans to re-assay the “pulps” used to produce a new 43-101 Inferred resource estimate. A Preliminary Economic Assessment (PEA) will follow. Yes, these properties are early stage, and total nearly 10,000 hectares. We have people reviewing the historical work done on the properties, which actually comprise five claim blocks. We will likely do some airborne electromagnetic survey work, but to be honest, the eastern Athabasca basin is a hotbed of activity, so we may just allow our neighbors to drill around us and see what they find. Our holding costs on the properties are extremely low. We are very pleased to have Dale Wallster join our technical advisory board. Dale is a geologist and prospector with 35 years of experience in North American mineral deposit exploration, with a focus on the targeting and discovery of unconformity-related uranium deposits. He was president and founder of Roughrider Uranium Corp., a company acquired by Hathor Exploration in 2006 for its strategically located uranium properties in the Athabasca Basin. Dale and his team are widely credited for the discovery of Hathor’s Roughrider deposit. In January 2012, Hathor became a wholly owned subsidiary of Rio Tinto as part of a C$650 million acquisition. Defense Metals (TSV-V: DEFN) / (OTCQB: DFMTF) offers an attractive, early-stage way to play the REE market. Our LREE deposit appears to be sizable and is open in multiple directions. It contains potentially economic amounts of select rare earth metals. At least two of the REEs, neodymium (Nd) and praseodymium (Pr) are quite valuable and in high demand for use in permanent magnets. There are indications that the metallurgy of the Wicheeda deposit is favorable and considerable testing is being done on metallurgy. If the company receives additional positive reports from SGS Canada, that could be a catalyst for our share price, as it would provide support for the thesis that we can put the project into initial production fairly quickly. While still early stage, the Wicheeda deposit has had ample historical work done on it dating back decades, and is undergoing significant, wide-ranging testing right now. If we can advance this project in 2019 the way that we think we can, our current market cap of C$5.1 million = US$3.8 million (23.75 million shares outstanding) could prove to be an attractive entry point. Thank you Max, that was very interesting. Congratulations on the new assay results. Note: Here’s a good recent article on Defense Metals. 2) The following companies mentioned in the article are billboard sponsors of Streetwise Reports: Defense Metals. Click here for important disclosures about sponsor fees. The information provided above is for informational purposes only and is not a recommendation to buy or sell any security.